Antique, Ford & Pointon, Fords Heraldic Ware "Royal Crest" Bone China Tea Set - Made in England from 1883 through 1936 - Total of (32) Pieces. 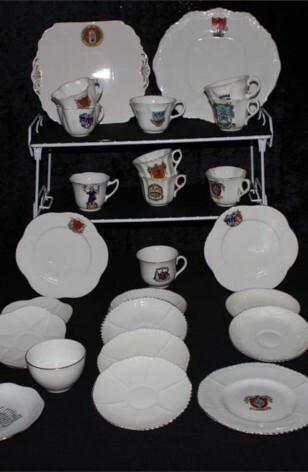 This delightful and interesting Bone China Set is Decorated by Ford's China in the Crested and Heraldic Theme. Background is White with 22kt Gold Trim on each Piece. There are a couple of different Shapes. However, the Crested or Heraldic Design is on all Pieces, except the Saucers. Commemorative Ware, as this is also called, was in vogue during the Late 1800's, and early 1900's when Ford & Pointon were in business, and many were sold as Souvenirs. A Ten Place Service missing only (1) Saucer and Creamer.